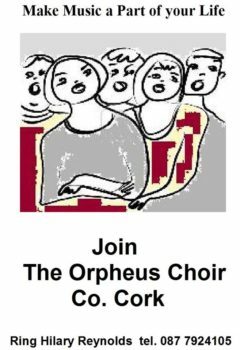 Join Hilary Reynolds and The Orpheus Choir on Mondays 8.00-10.00pm and sing your heart out. This community choir has been on the go since 2005. Always open to new members and drop ins. Or, if you just want to try it out, you will find a warm welcome amongst The Orpheus Choir. The choir gets involved in performances and choral festivals and love to have nights out, which always end in sing song. Call Hilary Reynolds on 0877924105 with any questions or queries.